"What a totally amazing little find this was! Music from around the world, in a field, great sound system, local beers/ciders, safe place for kids to make friends and explore, no trashy waste-of-money stalls, delicious food, kids tent with free stuff for them to do. Amazing!" "From 6 to 40-something year olds, everyone in our group had a wonderful time at this fantastic, quality, friendly festival. We've a great line-up of folk and world music again this year. There'll be local food and drink plus workshops for the kids too. There are no commercial stalls. It's simply about top-notch music in a relaxed, friendly atmosphere - perfect for families. Our festival is small and beautiful... and popular. So get your Early Bird tickets now and at discount prices too. In Rockhampton we punch above our weight. ​For 2019 we've a great line up of folk and world music including BBC Radio 2 Young Folk award nominees. It all happens in a small field by the church in our Gloucestershire village. There are no commercial stalls; it's simply about great music, top-notch local food and drink and a relaxed friendly atmosphere. ​And it's only 15 miles from Bristol. People tell us they love the friendly relaxed atmosphere at our festival. The field is compact and safe. You can keep an eye on your kids while relaxing and enjoying the music, local beer and good food. Would you like us to keep you up to date with news of the festival and when tickets are available? ​We won't bombard you with information, nor pass your details to anyone else. You can read our Privacy Notice here. Rockhampton might be a small village but when it comes to musical quality we certainly punch above our weight. We've been working hard over the winter and can now announce a brilliant line up of music and dance for 2019. We've a BBC Radio 2 folk award nominee, Eastern European energy, a wonderful Anglo-Gernan vocal duo, a Ceilidh and more. We're still working in more but you can see the line up so far here. Our happy band of scarecrows are waking up from their winter hibernation. Keep your eye out because they'll be out and about in the spring sunshine soon. Here are some of our favourites from last year. 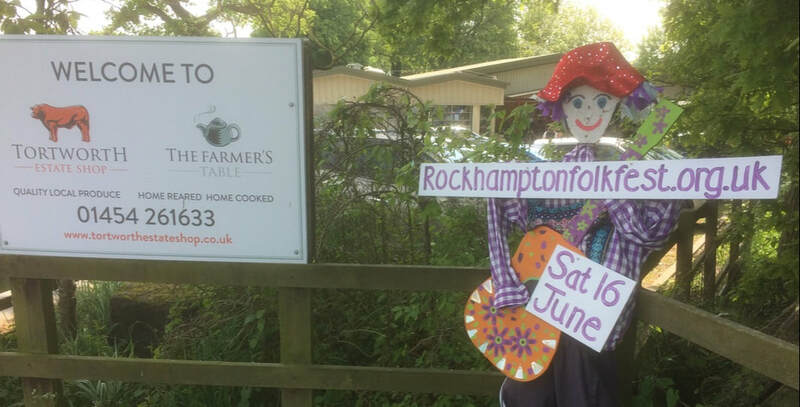 Thank you to the all the lovely local businesses and families who are host our merry band of scarecrows.